We are instrumental in manufacturing, supplying and exporting a quality range of Agricultural Weeders. All these agricultural products are precisely engineered by our professionals that are best in terms of quality and durability. Our product range also includes Cono Weeder and Finger Weeder. Further, before the final delivery of the product our quality controllers check these on various parameters.Owing features like high functionality, strength and long service life these products are highly applauded. To compliment our excellent product line, we also offer our clients a wide range of Hand OperatedCono Weeder/CIAE Weeder. We fabricate these plants using sophisticated technology and machinery which are procured from well known and leading vendors of the industry. Further, we are in technical collaboration with central institute of agricultural engineering, Bhopal. Our modern infrastructural facilities have enabled us to produce Rice / Paddy Weeder in large quantity which are sturdy and strong. Designed and fabricated using high quality plastic material it has 6 numbers of plain and 6 numbers of serrated blades embedded. 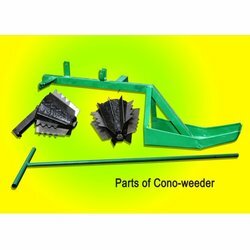 We are manufracturers and suppliers of Cono Weeder and Weeder Parts. These Wet Land Weeder are extensively used for weeding and seeding in between the rows of paddy crop in the field. Our range of SRI Weeder/Rotary Weeder can be operated manually and is fabricated using superior components and material. Can effectively uproot and bury weeds while the rotors create a back and forth movement in the top 3 cm of soil. 10 Number of cones (rotors) 2 Nos. 12 Cone Holder 2 Nos. 15 General Information The cono weeder has two conical rotors mounted in tandem with opposite orientation. Smooth and serrated blades are mounted alternately on the rotor to uproot and burry weeds when the rotors create a back and forth movement in the top 3 cm of soil.